We added a new feature this week to help professionals promote their business relationships. We now allow users to recognize anyone with a professional email address. Sometimes you want to recognize or be recognized by people outside of your immediate email domain. You may work at a university that has different subdomains or work at a regional office of a national company. Both of these situations require the ability recognize people in other domain networks. Along with being able to recognize any professional, user profiles are public. 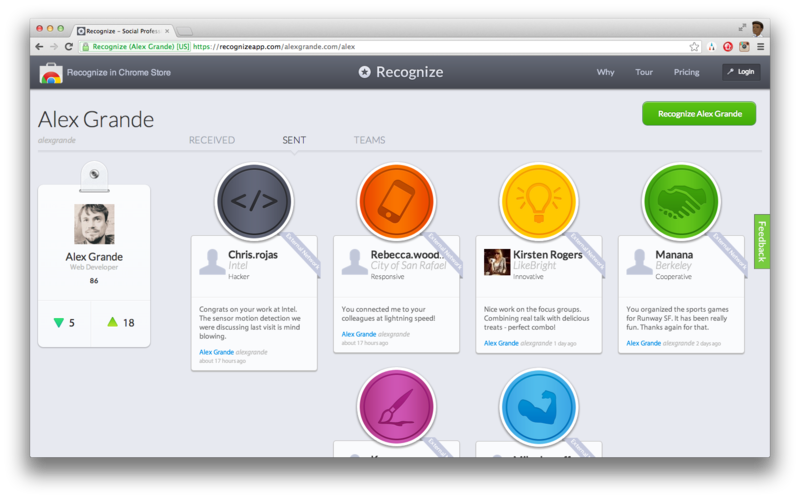 Much like LinkedIn, workers can now share their recognition profile with anyone to promote their abilities. We are excited to see the response from our customers. Cross company recognitions is a feature that has been requested a number of times from our users. This entry was posted in company, Employee Recognition, Launch on June 19, 2013 by Alex Grande.